Over the years, we've written travel pieces covering much of New Zealand, parts of the US, Scandinavia, the UK and more besides. But what of one of the closest and most popular destinations for Australians? On a working holiday to Bali, Mick Wust set out to see whether there's any solace for tourists with a more adventurous palate. First up, he works his way through the offerings from the bigger brewers – both local and imported. In part two, we'll find him digging deeper to see what, if anything, can be unearthed from craftier operations. If I had a dollar for every time I’ve heard that… Well, I’d have enough money to go to Bali again. Bali’s an enticing place to visit. Around six million tourists visit this tropical paradise each year and, with such cheap flights available from Australia, you can understand why many of those visitors are Aussies in search of an easy break. You can have the beach experience, swimming in the sparkling turquoise or lying on the sand with a chilled, island vibe. You can have the cultural experience, exploring interesting local dishes, traditional dances and temples with intricately carved stone sculptures. You can have the blissed out experience, soaking up tranquil green vistas, vegan food by the cartload and more forms of yoga than you can shake a lotus flower at. 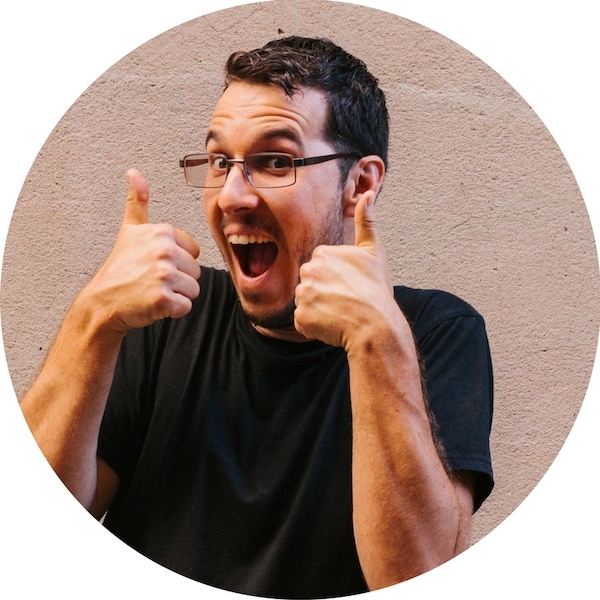 When I first came to Bali, I asked that question to as many people as I could and found it hard to get a satisfactory answer. So, on my second trip, I took it upon myself to research the beer options in Bali. It’s hard work, but someone’s gotta do it. "...little more flavour than the condensation rapidly running down the bottle onto the table..."
It’s the Carlton Draught, the VB, the XXXX of Bali. It’s in every bar, every cafe, every restaurant, every corner store, every supermarket. It’s the star of Indonesia, found on souvenir singlets and stubby coolers. The weather in Bali ranges from hot and wet in summer to warm and humid in winter, so it’s incredibly refreshing to knock back a mostly-cold Bintang (the fridges aren’t always as cold as you’d like). When you’re relaxing on a tropical beach, or eating the cheapest and spiciest meal of your life, a macro Asian lager has a powerful cooldown effect. It’s common to see crates of Bintang stacked outside shops and venues, soaking in more UV than a sunbather at Bondi who's fallen asleep before they could apply sunscreen. There are tinnies to be found in shops if you’re keen to try some that hasn’t seen the light, but most Bintang comes in green stubbies. Don’t worry too much, though – it’s been created with the Indonesian sun, heat and storage systems in mind – and, as far as beverages go, it’s essentially bulletproof. Every Bintang tastes more or less the same as the day it left the brewery. Of course, one of the biggest drawcards for Aussies is the price. In shops and most bars/restaurants/cafes, 330ml will cost you $2 to $3, 620ml about $3 to $5, although you may pay more in some higher end venues and in more touristy areas. All in all, Bintang is an easy beer. Easy to find, easy to drink, easy to pair with food, easy to forget. Fun fact: If you were wondering why the red star on the label looks familiar, it’s because Bintang was born from Heineken, and is owned by them. The Dutch colonised Indonesia in the 1800s, built a brewery in 1929, and then Indonesia gained independence in the 1940s. "So, what have you got then?" 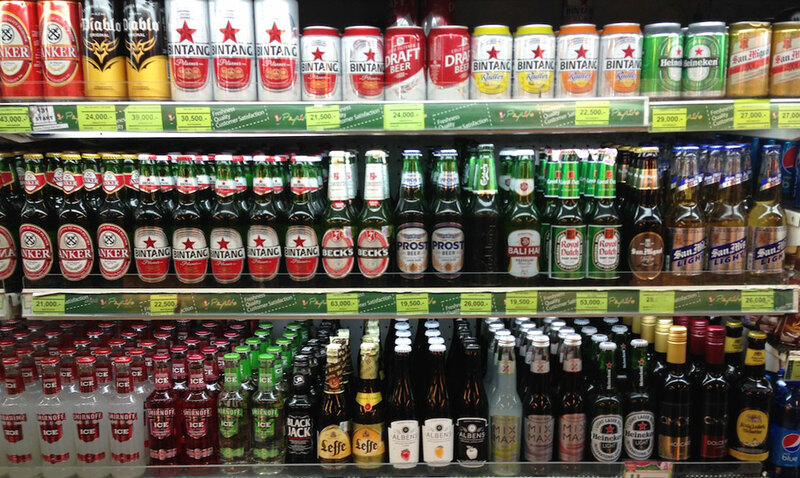 Of course, just because Bintang rules the airspace doesn’t mean there aren’t other commercial beers hovering just below, snapping up as much market share as they can. When it comes to other lagers, you’ve got a number to choose from. From within Indonesia, there’s Bali Hai Premium (Munich lager) and Draft Beer (lager), Anker (Czech pilsener), Prost (another Euro-style lager), and Kuda Putih (German pilsner). Depending on your tastes, you may find a preference within them (Bali Hai has more malt sweetness, Prost a slightly grainy character, Anker is cleaner, and Kudah Putih… no comment), but they’re each designed with the same goal of being inoffensive. 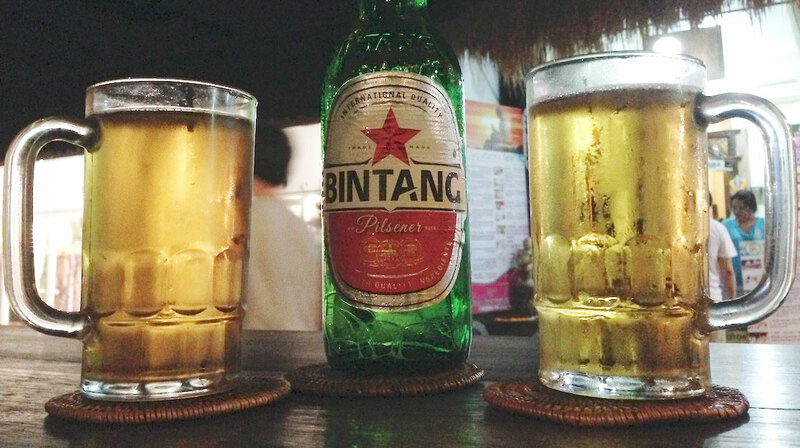 As with Bintang, they have little more flavour than the condensation rapidly running down the bottle onto the table. But, as with Bintang, you can generally forgive them when that first cool sip does valiant battle with the sweltering heat. 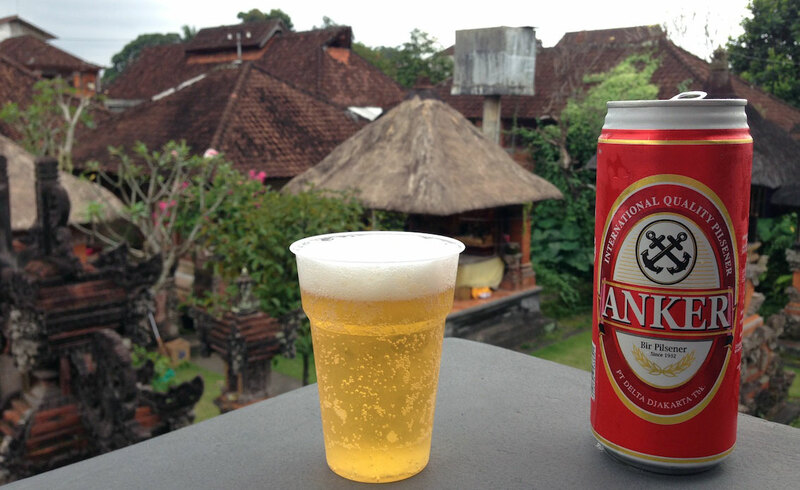 Looking outside Indonesia to the rest of the world, there’s a spread of lagers of varying availability. San Miguel and San Mig Light from the Philippines are quite widespread, as are Carlsberg (Denmark), Heineken and Heineken Light (The Netherlands). But, in dedicated bottle shops and some restaurants, you can also find Singha from Thailand, Sapporo from Japan, everyone’s favourite lime-wedged Mexican brew, Corona, Royal Dutch, also from The Netherlands, Beck’s from Germany, and Stella Artois from Belgium. 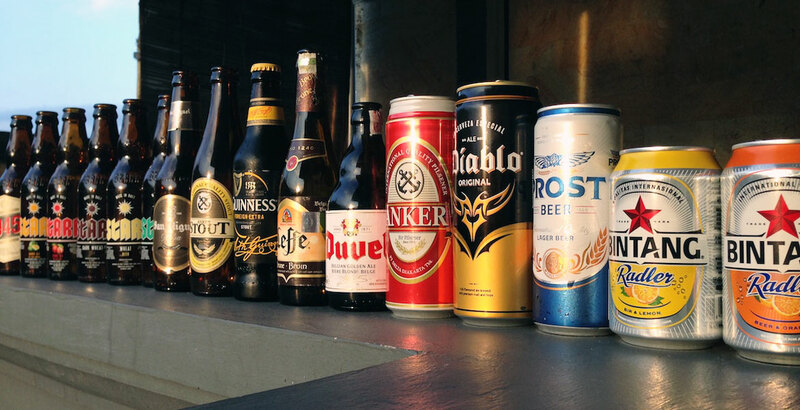 While this could be viewed as a selection of lagers from all over the globe, most of these Euro beers are contract brewed in South East Asia, including Indonesia. If you're after something with slightly more flavour to bring to the palate, Big Beer offers alternatives. Coming out of Bali Hai’s brewery, El Diablo Original is a locally brewed golden ale. While it may be a far cry from the superlative heights of the website’s description: “A distinct and intriguing beer”, “international quality Belgian Golden Ale”, “crafted to deliver the robust and one-of-a-kind taste that will inspire the most discerning beer drinker”, it does display a hop character the slew of lagers simply doesn’t. Or, if seeing bunches of bananas all over this tropical island has you hankering for some ester-y goodness, you can get your wheat beer fix from Hoegaarden (Belgium) and König Ludwig Weissbier (Germany), which some bottleshops stock. (The occasional traveler reports sightings of Erdinger Weissbier as well, though these sightings are rare.) A little sweetness goes a long way after nothing but pilseners. Of course, Bali isn’t all beaches and sunshine. Overcast days and rainy afternoons are a regular occurrence during the wet season (October to April), so it pays to bunker down somewhere dry with something dark. There are a few offerings available to scratch that particular itch. Anker, a locally brewed Czech pilsener style offering from Delta Djakarta. In the way of dark lagers, there’s San Miguel Negra and Panther Stout [sic – it's stout in name only], with the Negra showing dark fruits, while the Panther is more chocolatey. When it comes to actual stouts, you may be surprised by the local Anker Stout. It’s a surprisingly complex brew, starting with a roasty aroma with hints of molasses and liquorice, then some caramel, almost cola flavour, and finishing with liquorice and roastiness. Far more than one might expect from a macro SE Asian stout, anyway. After something with less alcohol still? You’re in the right place. Bali has non-alcoholic beer available in a range of flavours. Though the majority of the population in Bali (around 83 percent) follows Balinese Hinduism, Indonesia as a whole is a predominantly Muslim nation, with around 87 percent identifying as Muslim. This means many citizens don’t consume alcohol, and there are even vocal groups who lobby against the sale and consumption of alcohol in Indonesia. In such an environment, a market for alcohol-free beer has arisen, which some brands have leapt to meet. Sitting on the shelves beside Bintang Zero (which you surely expected) is Bintang Radler 0.0%, Guinness Zero and Guinness Zero with Lime and Ginseng. Despite their claims of "same flavour as the original", each of these has its own distinct taste (possibly with the exception of the Radler, which already masked the taste of alcohol). 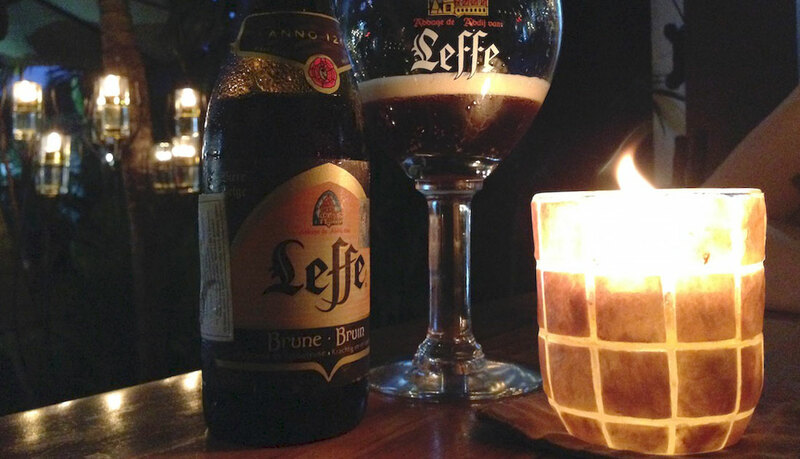 In some hidden corners of Bali, if you don’t look directly at them, you can find legitimate Belgian beers that are over 6 percent ABV, rich in colour and bold in flavour. There's the classic Duvel, a strong Belgian golden ale sitting at a lofty 8.5 percent ABV, Vedett Extra White, a 4.7 percent ABV witbier, and both Leffe Blond and its darker counterpart Leffe Brune (pictured above). Plunder these golden and mahogany treasures without hesitation; while they’ll cost significantly more than every beer mentioned above, you’ll find yourself savouring every drop. Just don’t say their names out loud or they might disappear. The kind of venues that serve these beers will even serve them in the correct glassware: Duvel in a tulip, and Leffe in what I can only describe as a chalice or grail, such it its splendour. On an island where it’s not unusual to drink Bintang tallies out of the bottle at a smidgeon below room temperature, being served a beer in the correct glassware is a unicorn firing magical rainbows from its horn. But is there more to be discovered beyond these Belgian imports? Yes, yes there is. And we'll be riding those magical rainbows all the way there in part two. You can read part two of this feature here and find other travel articles on The Crafty Pint here.